Today at the Mall in Washington, DC, is the "official" commemoration of the 50th anniversary of the March on Washington, including a speech by President Obama and remarks from past presidents. Tens of thousands of people marched in Washington last Saturday, committing to an agenda for rights and justice. 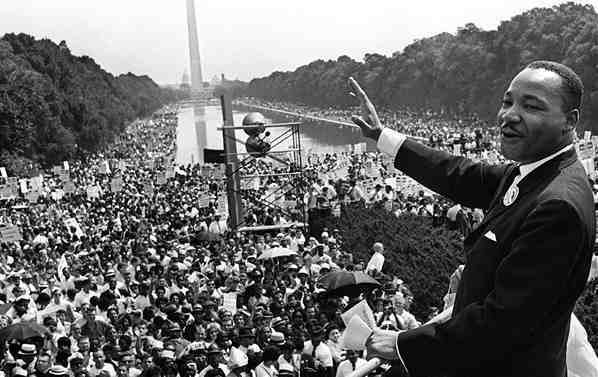 There have been many other events and activities recalling and celebrating the significance of that famous march--focused on racial justice, and so much more. Martin Luther King, Jr. had rallied the country against racial discrimination and segregation, as well as for workers' rights and economic justice, for peace. Many in our immigrant community today arrived here after that civil rights era, and yet, certainly must realize how connected our struggle for immigrant rights is to that pivotal period of US history, and how much more connected we need to be. There are many lessons for our movement from that period, and much inspiration for our continuing work for equality and justice. The public television documentary broadcast, "The March" provides a good background of the march, including the government surveillance of the organizers, and the political pressure exerted to stifle more progressive and radical voices and perspectives, to "soften" the messages. Click here to see The March video. Once again, we are happy to share this copy of Martin Luther King's "I Have a Dream" speech, delivered 50 years ago today. Let's continue the fight for racial and economic justice, for peace.